Stanford biologist Paul Ehrlich still sees runaway population growth as a threat to the planet, but is hopeful that humans can avoid the first catastrophic collapse of a global civilization. 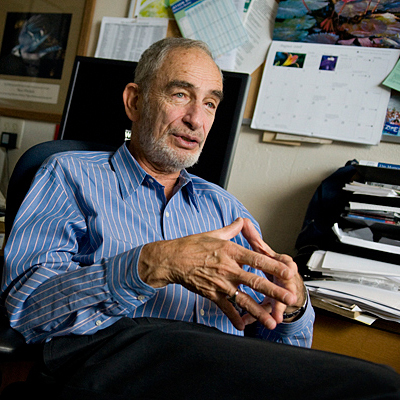 Stanford biologist Paul Ehrlich points to population and consumption as equally responsible for producing environmental damage. Today’s the day that, according to a United Nations tally, world population reaches seven billion — and could top ten billion by the end of the century. In his 1968 book, The Population Bomb, Stanford biologist Paul Ehrlich warned of the threat of unchecked human population growth. Over the past four decades, the book has brought attention to the question of how many individuals our planet can sustain. Today, Ehrlich reflects on what the four decades since have taught him. We are seeing climate disruption leading to rising food prices, loss of biodiversity, deteriorating ecosystem services, increased chances of vast epidemics and nuclear resource wars and a general reduction in the odds of avoiding the first catastrophic collapse of a global civilization. There has been a cheering reduction in birth rates, but sadly not far enough in rich countries such as the United States and Australia, and not sufficiently widespread. Will the additional 2 billion people projected to arrive by 2050 have the same environmental impact as adding the last 2 billion? No, they won’t. People are smart. Farmers didn’t first till marginal soils where water was scarce, but rather the most productive, well-watered soils they could find. To support 2 billion more, it will be necessary to farm ever poorer lands, use more dangerous and expensive agricultural inputs, win metals from ever-poorer ores, drill wells deeper or tap increasingly remote or more contaminated sources to obtain water, and then spend more energy to transport that water ever greater distances. All this will require vastly more energy than is now used. As a result, the next 2 billion people probably will do disproportionately much more damage to our life-support systems than did the last 2 billion. Of course, if humanity got serious about protecting the environment, and now especially the atmosphere, the next 2 billion could do less damage. Sometimes we hear reference to a “cluster bomb” of growth rather than a “population bomb.” What does this mean? Sadly, this howler slipped through the refereeing system at Science, the world’s premier science journal, in a recent issue on population. The “cluster bomb” focuses on the population plight of a cluster of poor countries that struggle with rapid population growth and increasing hunger, without looking at the role of rich countries in worsening that plight. More importantly, it doesn’t look at the role of wealthy countries in contributing to the most important population-related problems that are global: climate disruption, toxification of the entire planet, the possibly insurmountable challenge of transitioning rapidly away from fossil fuels, looting of the seas, and increasing the risks of pandemics and nuclear war. How do you respond to the statement that we should focus on overconsumption, not population growth? Most of humanity’s environmental problems trace to too much total consumption, but that consumption is a product of population size and per-capita consumption. Population and consumption are no more separable in producing environmental damage than the length and width of a rectangle can be separated in producing its area – both are equally important. Can individuals with high per-capita consumption make a difference by changing their behaviors, or do we need to look to systematic changes? Individual changes can help, but we really need a widespread, bottom-up social movement such as the one which Millennium Alliance for Humanity and the Biosphere (MAHB) is trying to generate. The MAHB is an outfit you can join if you want to help figure out how society can avoid a collapse. Political action is essential. Is it possible to increase gross domestic product (GDP) without consuming ever more resources? GDP is a lousy measure of a society’s health or people’s happiness. That healthy economies can grow forever at 3.5 percent per year may be the most widespread folly in our popular culture. It actually implies that in 20 years the capacity of Earth’s environment to support us could be roughly cut in half, because the scale of the human enterprise will have doubled. It also implies that in a couple of centuries, that capacity could be reduced to something like one-hundredth of today’s capacity. Perpetual growth is the creed of the cancer cell. One way to see this is to watch the fine new movie, GrowthBusters: Hooked on Growth. Do leaders have the information that they need to address the consequences of a world with 7 billion people? There is a small but special portion of our culture that, if widely understood, could greatly increase the odds of reaching a sustainable society. That portion includes what is known of human evolution, which provides essential background on human behavior. It also includes understanding what humanity is doing to undermine its own life-support systems and the likely consequences of those activities. If we don’t change how we treat each other and those vital systems, society almost certainly will collapse. Your pessimism receives a great deal of recognition. But what makes you optimistic about the future? When the time is ripe, human societies have shown an incredible ability to shift gears and move in a new direction. Examples in my own lifetime are the American mobilization for World War II, which showed that consumption patterns could change overnight; the success of the civil rights and women’s rights movements; the quick drop in fertility in the U.S. around 1970; and the breakup of the Soviet Union, all relatively unexpected. When the time is ripe, I’m optimistic that how we treat our environment and other people will move to the top of the political agenda everywhere. I only fear it will not be in time. This post originally appeared on the Stanford University News site. Sarah Jane Keller is a science-writing intern at the Stanford News Service.